Delicious pure white, round roots. Harvest at 'ping pong' ball size for best flavour. The tops may also be used for stir-fry or boiling. Row 3m (10'). RHS Award of Garden Merit winner. With our mini-vegetables even the smallest plot can yield a wealth of succulent, tasty produce. By sowing closely together in blocks or broad drills and cropping while young, you can fit far more into a small area. Sow end April-end July. Advised minimum distances between rows 15cm (6"). Ideal distance between plants in the row 2.5cm (1"). Sow direct into finely raked soil when conditions are favourable in spring, then at 2-3 week intervals until the end of July. Special varieties have been chosen which are particularly suitable for eating at a young stage when they are quite small. 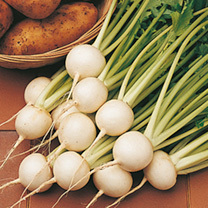 Eat them raw in salads, lightly steamed or used in stir-fry recipes. For best results you must ensure the soil is fertile and well prepared. Dig in garden compost or peat prior to sowing or planting and apply fertiliser between crops. HEALTH BENEFITS: Both roots and green tops may be used and are high in vitamin C (Anti-ageing, wound healing, decreasing blood cholesterol and prevention of infections. Assists the body in absorbing iron) and fibre. 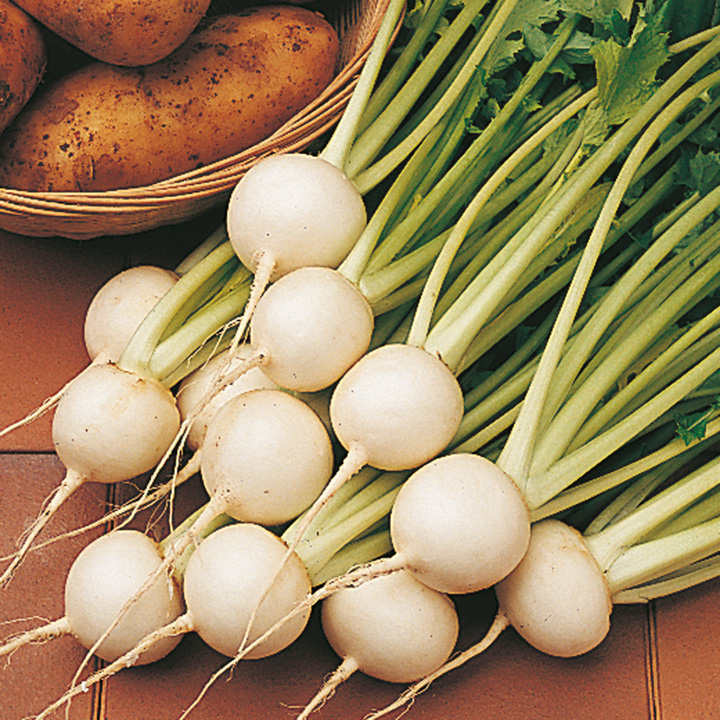 COOKING HINTS: Unlike many vegetables, turnips retain their nutrients well when cooked.